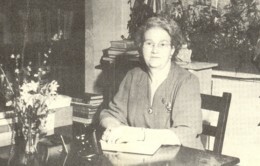 Mrs. Ola Daniell was the Bogart Librarian in 1949. She and her husband DeWitt Daniell, descendant of William Daniell, lived adjacent to the Bogart School campus. Their son, James Daniell, was Boys Basketball Coach in 1950. Their daughter-in-law, Martha Daniell (Mrs. Frances Daniell) was teaching at Bogart in 1950. DeWitt Daniell was my Uncle and was fiercely loyal to Bogart and was very particular about his surname having the two "L"s.
I learned some Daniell History from Uncle DeWitt, son of Y. H. (Pappy) Daniell who was shot in Winder in 1905. DeWitt and my Grandmother, Hassie Daniell Dawson, grew up in the same home where my father and my generation grew up on Cliff Dawson Road.